Within three months of embarking on the Lift crewmember recognition platform, an internal monthly JetBlue survey revealed an 88 percent increase in crewmember satisfaction with rewards and recognition. The Lift program weaves JetBlue’s distinctive branding into a robust reward and recognition experience directly linked to the company values of Safety, Caring, Integrity, Fun and Passion. 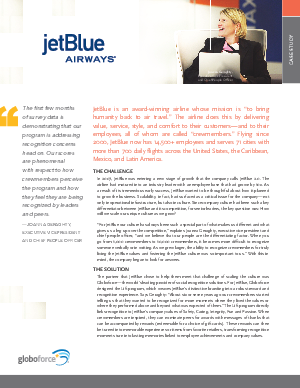 The program offers accessibility for JetBlue’s mobile workforce, and peer-to-peer recognition that puts teamwork and culture front and center.